You might actually know this plant more for its mottled leaves than for its flower. White Dogtooth Violet, Erythronium albidum, is a delicate, early spring, native perennial; it is usually found in colonies and has an affinity for moist soil on gentle woodland slopes. The word "Dogtooth" appears in the name since the plant grows from a small edible corm which some folks think looks like a dog's tooth. The word "Violet" appears because the flower in some ways resembles a violet. But perhaps a better common name for the plant, one which seems more logical, is White Trout Lily, given that the species is a member of the Lily family, Liliaceae, not the Violet family, and the leaves are generally mottled like trout. Well, that's behind us! The basal leaves are really attractive — up to 6" long and 2" wide — with a lanceolate or elliptical shape, smooth margins, and a pale green upper surface usually mottled with maroon or brown spots. New or immature plants have just a single leaf. They are sterile and thus bear no flower, and plants usually remain in this single-leaf state for 3 to 8 years. Mature plants boast two leaves and usually produce a flower — a single delicate upside-down flower on a slender, naked, drooping stalk. That drooping stalk may reach a height of perhaps 6 inches or more. The leaves appear in colonies, and the single leaves always outnumber the pairs of leaves. The colonies appear because the dogtooth-shaped, 1-inch long corms, which are several inches underground, occasionally send out stolons which create new plants several inches away. It can take decades without disturbance for large colonies to appear, and these delicate plants don't respond well to being transplanted, so it is best to leave them where they are. The flowers can reach a diameter of 1.5 inches or more. They are made up of three white, lanceolate-shaped tepals and three similar petals which curve backward and reach for the sky. The white tepals and petals are accented by six stamens with very long yellow anthers. In the center is a stigma with three spreading lobes. The flowers generally appear in April and bloom for close to two weeks. These flowers are pollinated by just about every kind of bee in the neighborhood. 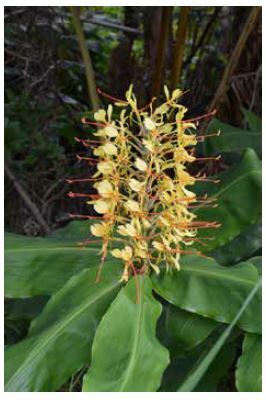 If fertilized, the flowers are replaced by 0.75" long seed capsules. Apparently, in times past, this plant species was used to address a bundle of health issues — the treatment of gout, to heal wounds, as a contraceptive, for tumors and inflammation of the bowels, for relief of nosebleeds and sore eyes, for hiccups, and even for vomiting. White Dogtooth Violet is found throughout Eastern North America. Indeed, this attractive, but fragile, wildflower is common throughout Illinois, appearing in every county but Jo Daviess. How many of you know where that county is?